Since XenDesktop 5 came out, one of the biggest questions flying around is, “Should I use Provisioning Services (PVS) or Machine Creation Services (MCS)?” Both options work and both options provide single image management, but what is the right answer? Is it shocking that this question is the wrong question to ask? What you should be asking is “What is my desktop virtualization solution going to look like?” Are we only doing Hosted VDI desktops? Do we need Local VMs? Are Hosted Shared Desktops in the mix? (Note: look at the Citrix FlexCast site for a description of each option). Each organization’s desktop transformation roadmap plays an important role in picking the right option. 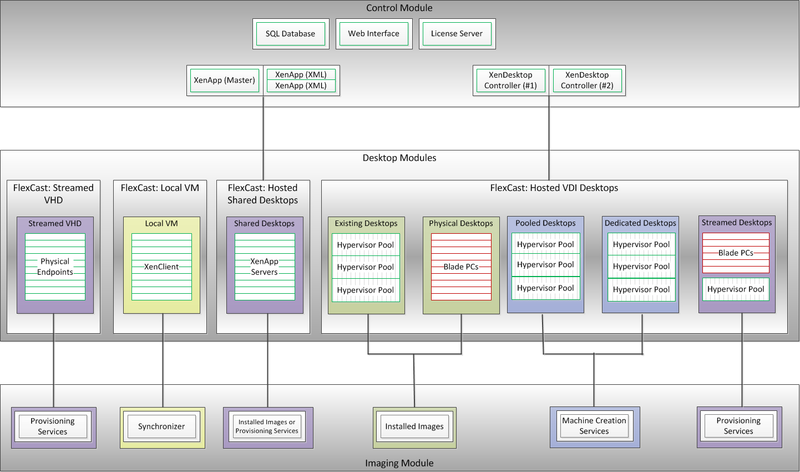 The following diagram was taken from the XenDesktop 5 Reference Architecture, which can be found in the XenDesktop Design Handbook. One thing you should be able to see is that if you select Machine Creation Services, you can only do the Hosted VDI desktop model on a hypervisor (XenServer, Hyper-V or vSphere) in the data center ONLY. That means no Blade PCs. It means no Hosted Shared Desktops. It means no streamed VHDs. If this is your roadmap, then Machine Creation Services is still a viable option, but the decision cannot be made yet. You still need to look at a few other considerations like SAN requirements, storm impacts, imaging team expertise, etc. before you can make a proper decision, which will be discussed in future blogs. But what if your design calls for some of these other FlexCast options? Then Provisioning Services will definitely play a major role. However, there still might be a need for a mixed imaging solution based on a few other decision factors. For example, what if you need a desktop where users have complete control of the desktop to install applications or make operating system-level changes that are not captured in profile management tools? I can still do Existing, Physical, Dedicated and Streamed desktops. However, would you use PVS for this (streamed desktops)? It does work, but you probably won’t go with this option. In my experience, using a private desktop model with Provisioning Services is not efficient. It requires complete copies of the base image, configured for private (read/write) mode. You still have to manage these images in a 1:1 fashion (or use an enterprise desktop management tool). You are essentially adding too many layers where other options might be a better fit. You don’t want to focus on which technology to use, you want to focus on the overall architecture, which will help guide your decision. But the decision is based on more than the big picture. You need to stay tuned for more on this topic as this isn’t the end yet. We still need to dive deeper into the Hosted VDI Desktop model only scenario to align our business requirements with the appropriate solution. I’m going to be deploying XenDesktop 5 in the next few months on top of a FlexPod. Do you think NetApp’s zero cost cloning would mitigate the efficiency problems you mention above with using PVS for persistent desktops, either streamed or hosted? I’ve used MCS at a customer to set up a Dedicated Desktops, noticed that they all have the identical CMID’s, do you know if this is an issue Citrix is looking into? Daniel, you mention that before making the decision about whether to use MCS or PVS, we first need to look at other considerations like SAN requirements, storm impacts etc. I am particularly interested in this since I am in a project where all this is much too unknown. I didn’t find any information about this yet, so if it is already somewhere, please let me know. Overall this blog is a real necessity if you want to deploy XenDesktop 5, so please write more! Hello Daniel, nice article as always. – The concept of having an image and differencial updates are clear but does MCS have the same idea of having an image and only updates to profiles are written to disks? I’ve read many whitepapers from Citrix, reference architecture and this point is not that clear to me. — If so, the same rules of choosing profile management options (mandatory, Citrix Profile Management, etc) are in place? – If not, and it seems this the answer, I assume the consumption (size and IOPS) of MCS is bigger than PVS, right? I’ve already read about IOPS increase but I’m not sure about what happens when you’re using MCS with dedicated vdesktops. If I don’t want my users to change the base image (but want to allow the profile personalization usng Citrix Profile Mgmt Tool – or not, through the mandatory profile), is the MCS the best (or viable…) option? Am I supposed to rely on GPOs to not allow users to interact (and possibly mess) with the image? Thanks and sorry about the long post. Keep the good work!